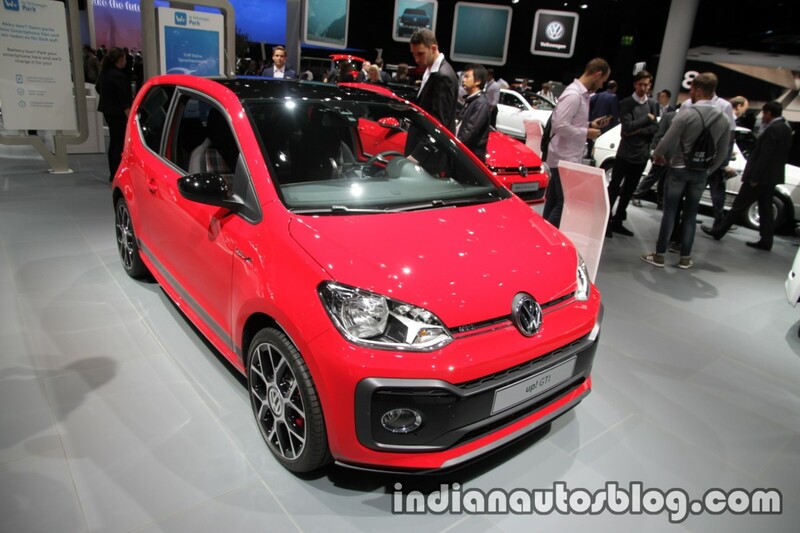 Volkswagen is showcasing the VW up! GTI at the 2017 Frankfurt Motor Show. The GTI variant of VW's smallest hatchback was unveiled in May 2017, 41 years after the first Golf GTI was presented. A 1.0 L TSI petrol engine powers the VW up! GTI. This 999 cc turbocharged unit produces maximum power of 115 PS between 5,000 and 5,500 rpm and peak torque of 200 Nm between 2,000 and 3,500 rpm. A 6-speed manual gearbox transmits powers to the front wheels. The VW up! GTI takes 8.8 seconds to reach the 100 km/h mark and has a top speed of 197 km/h. It measures 3,600 mm long, 1,489 mm high and 1,641 mm wide and tips the scales at 997 kg. The exterior gets a classic GTI treatment. At the front, the grille gets the signature red horizontal stripe towards the lower edge accompanied by the 'GTI' badge. The characteristic transverse body colour patch in the bumper comes in high-gloss black on the VW up! GTI. There's also a discreet front spiltter placed right below the narrow air intake. Visual updates to the rear section include a larger roof spoiler, a red horizontal stripe running across the boot lid and 'GTI' badging. The side profile of the car features a double stripe across the side sill. Interestingly, the width and the distance between the stripes is based on the dimensions of those on the first Golf GTI. Other highlights include gloss black ORVMs, side GTI logo and 17-inch alloy wheels. The seats get the 'Clark' pattern fabric, a signature GTI trait. There's also a GTI branded flat bottom steering wheel, GTI door sill panel trims, and a GTI gear knob on offer. The interior trims get red stitching while the roof panel gets a black lining. The dashboard features "Pixels red” design. Features on offer include a “Composition” radio system accompanied by six loudspeakers, air conditioning, heated seats, electrically adjustable and heated door mirrors, and front fog lights with static cornering lights. VW will offer the up! GTI in five colour options - Pure White, Tornado Red, Dark Silver, Black Pearl and Costa Azul. The car can be specced with a black roof as well. The VW up! GTI will go on sale in Europe early next year.